No one wants to refinish hardwood flooring by themselves. It is a lot of work if you do it yourself and there’s usually dust that just permeates the entire house. 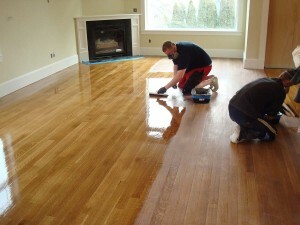 This makes for a big cleaning job after the job of installing or refinishing a hardwood floor is completed. Also most people do not have the time to do the job quickly due to work situations and other commitments. As a result a couple days worth of work can stretch into weeks or longer. At some point it needs to be done if you want your home to look fantastic and be presentable. There is a proper way to refinish hardwood floors that can save you or at least reduce the amount of work that needs to be done. Here’s our suggested step-by-step approach. Seal doors and vents to try and reduce the amount of dust that will travel throughout the house. If you have a furnace, central air furnace or central air-conditioning turn this off so that dust is not sucked from the room and blown throughout the rest of the house. Start sanding only in the direction of the grain. If you sand across the grain, there will be scratch marks all over your floor that will be amplified when you apply the stain and/or verathane at the end of the job. Use a sander that comes with a vacuum to trap as much dust as you possibly can. The vacuum should either exit outside the house through the window or terminate in a bag which you need to empty often. Vacuum up all saw dust once you’re finished sanding to get as much dust as possible out of the room. Wipe up all dust with a tack cloth to remove all dust and avoid leaving marks on your refinished hardwood floor. The last point that we wanted to offer readers is to suggest that if you are unsure about something, speak to experts at the hardware store where you purchase you materials. They will often offer classes to help people learn how to refinish floors and other home renovation projects. These can be quite helpful and are usually free to people who sign up.